According to the type of artwork (oils, pastels, watercolour, sketches, prints, among others) we offer creative framing solutions that will bring out the best in the work as well as ensuring the physical security of the piece. We use only the finest gilding techniques working with a full range of gold leaf and fine silver so that in accordance with our clients wishes, we can produce a choice of finishes in matte or burnished gold leaf or silver. We carry out all styles of marbling, painting of picture-frames, furniture and small objects, portraits, frescoes and murals. 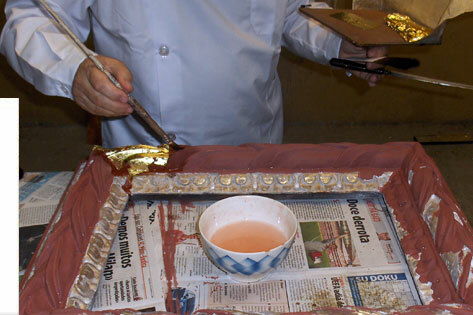 We restore wood, carved and gesso frames working with specialized workshops for the restoration of paintings on canvas or paper.